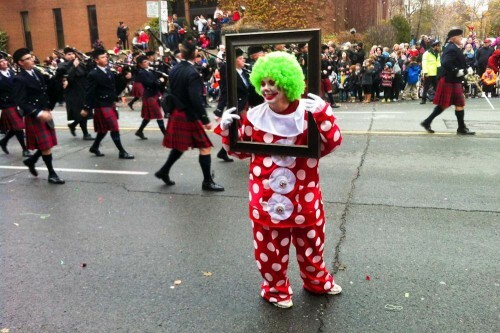 Yesterday was the day of the 2013 Toronto Santa Claus Parade! At 5.6km long and having been held every year since 1905, it’s one of the longest running and altogether largest parades of its kind anywhere in the world. Now, I’m normally a major grinch when it comes to Christmas-related items. I’ve always thought it was a silly celebration in the southern hemisphere (commercially speaking, anyway). We’re bombarded with images of snow and Santa and reindeer when in reality it’s 42 degrees under the blistering hot sun and as humid as a sauna. But seeing as I’ll be in the northern hemisphere for Christmas this year, I figured I’d at least make a small effort to soak in the traditional wintry Christmas imagery we’re all so familiar with. I almost didn’t bother going to the parade until my friend Laura mentioned on FB how impressive the floats all looked as she walked past them lining up for the event early in the morning – not to mention the fact that there was a One Direction float in the mix. That was enough to convince me to get out of the house, but I still had the inkling I wouldn’t be impressed, so I declined to carry around my camera. Thankfully I still had my phone camera, because it actually turned out to be a darn lot more impressive than I could have imagined. Never in my life have I seen such a conglomeration of clowns, marching bands, gorilla/monkey/bee/squirrel/giraffe onesies, fairy floss, Santa Claus hats and floats featuring all kinds of crazy Christmassy characters… it was insane! And I couldn’t believe how many participants there were and how many people lined the streets to observe the jolly festivities.